Matthijs van Heijningen Jr.'s horror thriller is both a prequel to and a remake of John Carpenter's 1982 film of the same name. Technically, the events in this film take place prior to the troubles depicted in Thing '82, but they are pretty much the exact same events. 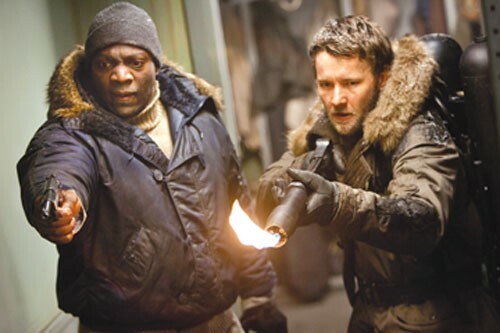 An American biologist (Mary Elizabeth Winstead) joins a mostly Norwegian group of researchers at an Antarctic outpost, after an alien lifeform is found encased in the ice. It's all very exciting, until the ice melts and the freaky creature gets loose. Since it has the ability to morph itself into any organic shape -- a dog, say, or a Norwegian scientist -- tracking it down and killing it is a challenge. For my money, the best part of the thrice-told Thing tale (which debuted in a 1951 film, The Thing From Another World, set at the North Pole) is the tension generated by terrified people, forced to interact in a confined space with a monster that looks like one of them. Van Heijningen delivers a scene or two of distrust and quiet panic, but he clearly favors showcasing the ooey-gooey monster over developing and exploiting the inter-personal relationships. The Thing gets ample screen time, in several varieties of realistically rendered, twisted-human gross-out, but I'd rather see a fraught dinner scene than a shrieking alien eviscerating another nameless guy with a beard. Similarly, the last reel seems to abandon the psychological aspects in favor of an off-base expedition that is unnecessary to the plot and a sci-fi cliché to boot. Nonetheless, this Thing is a well-produced B-movie, and a good night out if you want a little nail-biting combined with gore and gorgeous frozen landscapes. Be sure to stick around through the credits, which are intercut with scenes that explicitly link this Thing to Carpenter's Thing. In English, and Norwegian, with subtitles.